Let yourself escape into a total immersion world. Your workout will be over before you know it. 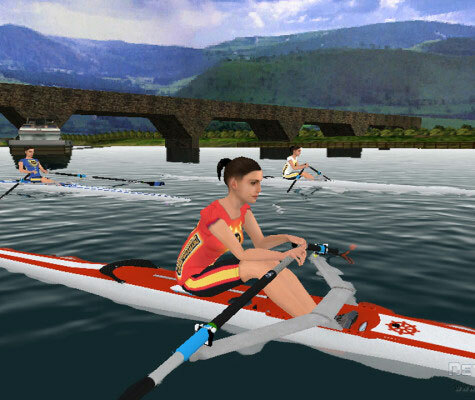 Provides a Virtual Reality rowing course on which you can row against other people over the internet or over a network. Alternatively you can record a session and train against it at a later date. There are various different courses, the virtual reality graphics are cutting edge. High Resolution 3-D Graphics capture the look and feel of the great outdoors. 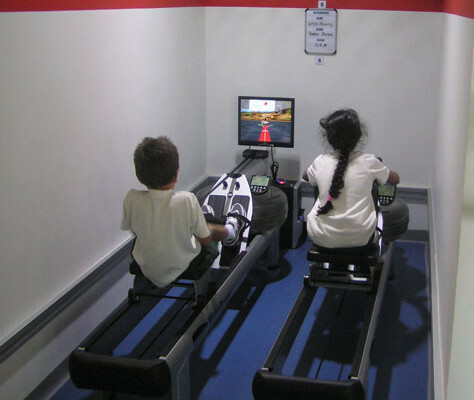 The rowing stroke uses a vast combination of muscles. From the tips of the fingers holding the handle/oars, to the balls of the feet connected to the footboard/boat, all the muscles between these two points contribute to the rowing stroke. By maximizing the muscle mass contributing to the exercise in this way, the WaterRower VGS is unrivaled in benefit derived per unit of time. Other common aerobic exercise equipment such as treadmills, cycles, ellipticals, even other rowing machines, use far less muscle mass, burn fewer calories, and generate less exercise benefit.